The following is a guest post by Marilyn Webster. 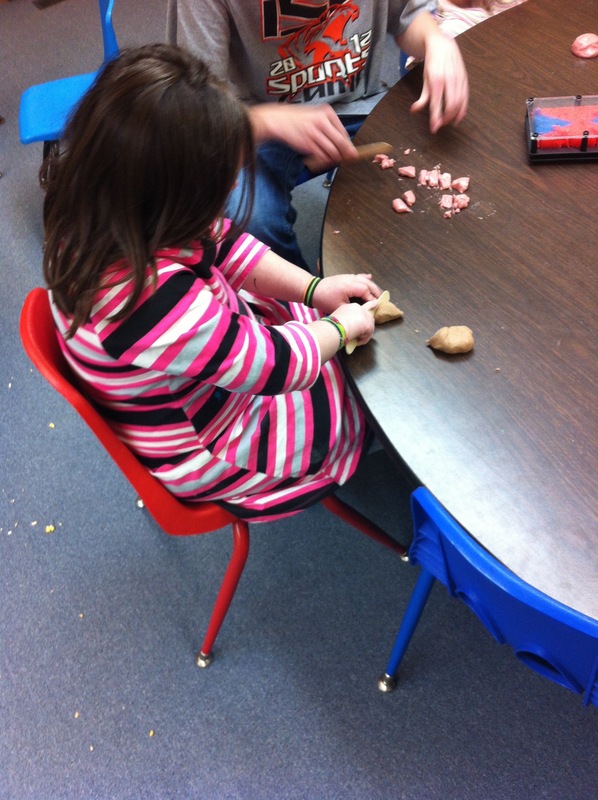 After Marilyn told me about this activity she created and led, I mentioned that I would love for her to share it here on the blog. I’m so glad she took me up on it! Hi, my name is Marilyn Webster, and my daughter has been a client of Rachel’s for years! As my daughter with autism grew, we found it harder and harder to find fun activities that we could enjoy as a family. Her interests and abilities were not the same as her peers, and she was too old to join preschool groups anymore. And so, I started my own group with the support of my church! We call them family fun nights, and all families with special needs kids are welcome to attend. Our group serves a few functions for our families: it provides us with a sense of community, provides fun activities which our kids are able to fully participate in, and gives families who often feel isolated “something to do”. As I plan events, one question I challenge myself with is: how can I find ways to take situations which either I personally or others in the group shared have been difficult to access for our kids, and make it accessible? Some of the most commented on events that families find difficult are holidays. Parents desperately want their kids to be able to enjoy these important cultural and family events and participate in the traditions, but our kids can find it overwhelming and confusing. Now, you’ve probably jumped quickly to the melee of Christmas or the raucousness of Halloween, and you are right, those are struggles. But the one holiday that comes up in conversation more often than you might think is Thanksgiving, and if you give it a moment of reflection, this makes sense. First of all, the whole idea of Thanksgiving is very abstract. Some of our kids can’t grasp the idea of gratitude yet, and this isn’t a holiday with a lot of concrete symbols like Santa, pumpkins, or eggs that our kids might be able to enjoy. 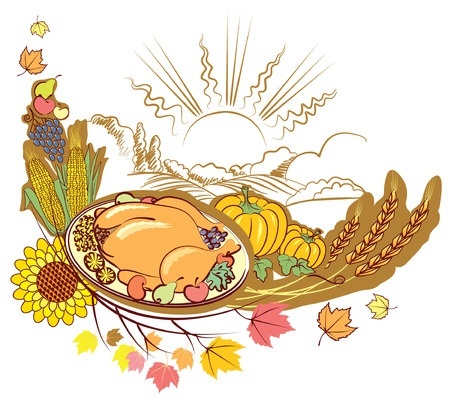 In fact, the only physical symbols of Thanksgiving are foods! And food is one area where our kids tend to struggle immensely! New foods are frightening, and many of our kids have very narrow diets. So, how to make Thanksgiving a fun and welcoming experience? I created a sensory Thanksgiving feast! This way, kids could explore the smells, textures, and appearances of traditional Thanksgiving foods in a fun, non-threatening way, and maybe build a connection to what we mean when we talk about the holiday. Pumpkin pie playdough: You can use whatever basic play dough recipe you prefer, but add pumpkin pie spices to it and color it to look like pumpkin pie filling. 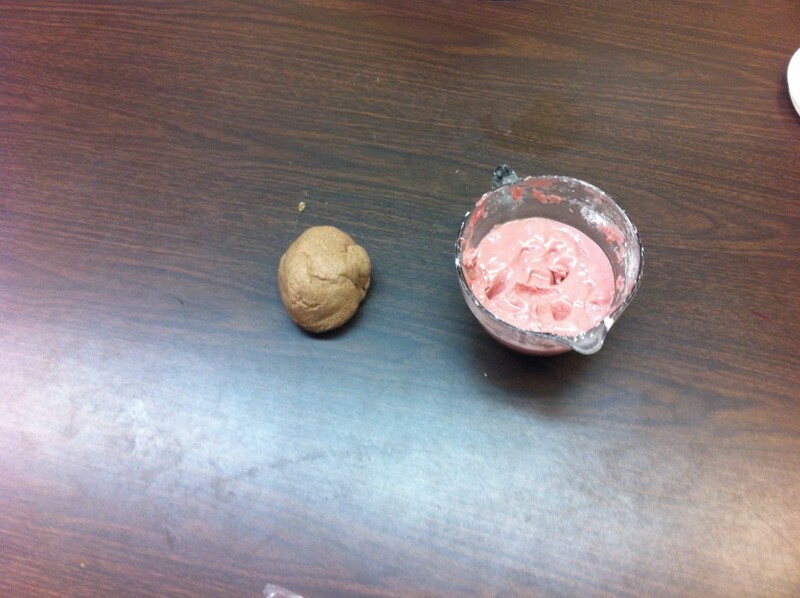 Cranberry sauce playdough: The texture of this was a bit weird, and most kids didn’t really like it. I think a simple activity with whole cranberries might have been more fun. But here is the recipe. 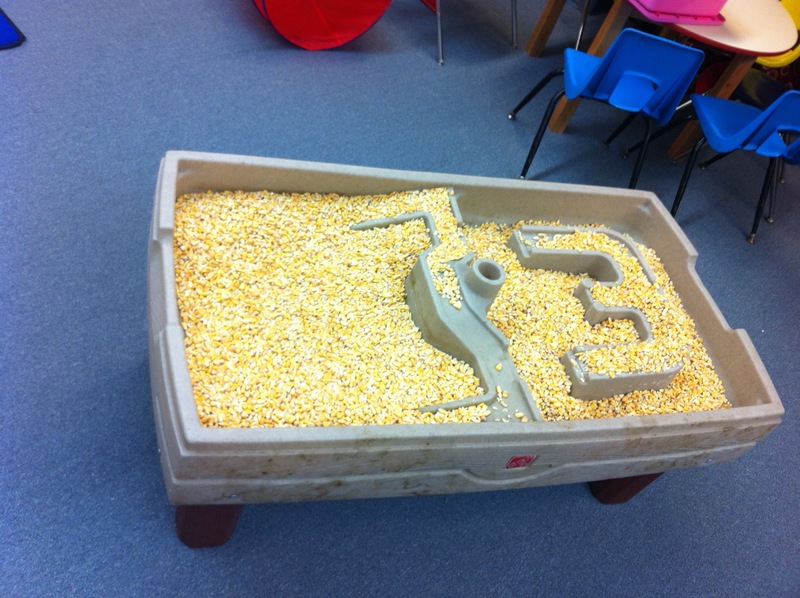 Dry corn sensory bin: We filled a water table with that dry corn you throw out for the birds. It was a huge hit! 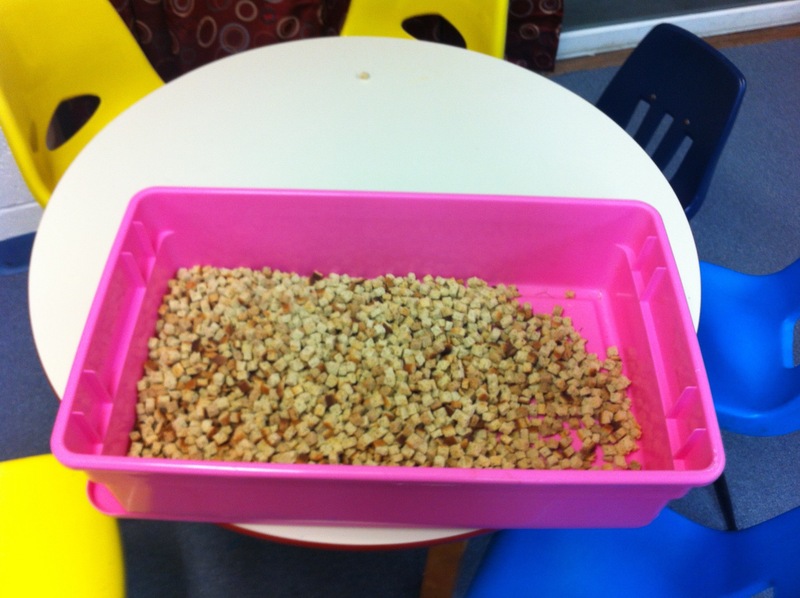 Dry stuffing sensory bin: two bags of dry store bought stuffing in a wide, low bin. I think this bin was responsible for making the whole room smell like Thanksgiving! 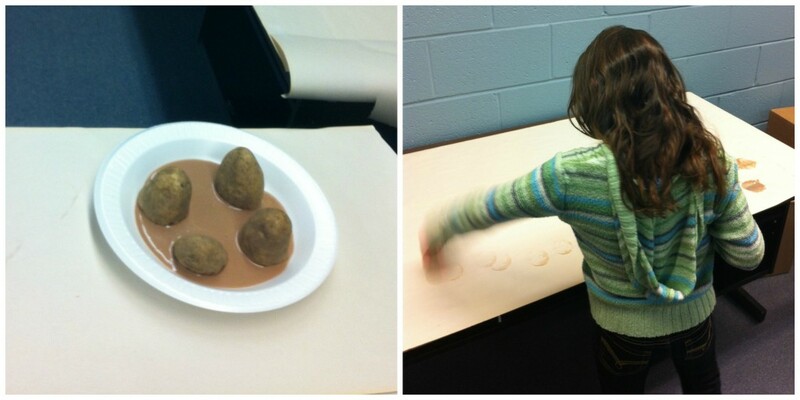 Potatoes and “gravy” stamp painting: I cut a few potatoes in half to stamp with. Then I mixed a dry turkey gravy packet into some plain yogurt to use as paint. It looked and smelled like real gravy! This was most definitely “process art” as opposed to “product art”. While kids explored the feast, we sang a few songs having to do with turkeys and saying thank you. Our kids had a blast playing with all the Thanksgiving goodies, and their parents had fun being able to enjoy traditional holiday foods with them, albeit in a very unusual way! I know when we sat down to our Thanksgiving feast, and my daughter had her usual plate of spaghetti while the rest of us dug into the turkey, I was thankful that she had at least enjoyed a sensory Thanksgiving meal of her own. The following is a guest post by Amy Kalas Buser, MM, MT-BC. Amy is the owner of Wholesome Harmonies, LLC, where her mission is to support other music therapists in their work with children and teens of all abilities. by providing quality resources to inspire creativity. She offers E-Books, songs and blog posts that provide creative session planning ideas and inspiration. My husband tells me that our baby is going to grow up thinking her life is a musical. I must admit, I have to agree. My baby Brooke is 10 months old and I spend a good portion of the day singing my way through our daily routine and using instruments to calm, excite, and inspire her curiosity. I always knew I’d use my skills as a music therapist when I became a mom, but I had no idea just how crucial those skills would be in helping me bond with my baby and move smoothly through our daily routine. Barney’s Clean Up song has made it a breeze to clean boogies off Brooke’s nose and wipe sticky banana off her hands. “My Bonnie Lies Over the Ocean” has allowed me to rock and calm her even after she’s gotten shots at the doctor. I created a song for each part of our day. I sing a wake up song, a diaper changing song, a cleanup song after each meal, a bath song, and a good night song. I also create other songs on the spot as needed. I can’t tell you how many times I’ve sung something like “Mommy’s in the kitchen putting dishes away!” or “Mommy is folding all your laundry!” Sometimes these are just spoken in a sing-songy voice, but the result is a baby who feels like she’s part of what’s going on and is able to connect what I’m singing with what I’m doing. The incredible thing is – Brooke recognizes her song! There have been countless times that she’s been crying and when I start singing this song she stops, looks up at me, and smiles. I know it’s because she recognizes her song! We sing EVERYTHING to the tune of “La Cucaracha.” It’s fun and words just seem to fit in perfectly with the catchy melody. This one tends to be an earworm, so I apologize in advance. Another piggyback song I sing is to the tune of “I’ve Been Working on the Railroad” (the part that goes “someone’s in the kitchen with Dinah”). Whenever we list all the family members that love her, she giggles and giggles. I have to say, there is nothing in the world that compares to the look of recognition on Brooke’s face and the smile that emerges when she recognizes all of “her” songs. The following is a guest post by Mary Altom, a board-certified music therapist and neurologic music therapist. She owns Sound Starts Music, a private practice in Frisco, TX and Music Therapy Kids, an online resource for parents and professionals working with children who have special needs. Growing up, I didn’t have a lot of experience with babies or little kids. My cousins lived far away. I was not one to babysit for extra money. I was never one to fawn over new babies at church, and I certainly didn’t spend time wishing for one of my own. 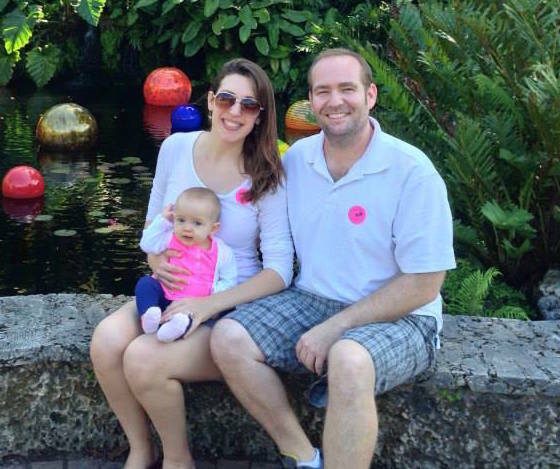 My husband and I were married for 5 years before we had our son Jaxon (he’s now 2 ½). At first I was clueless. I had no idea how to hold a baby or change a diaper. And we went to every parenting class offered by the hospital. As you fellow mamas know, the “mommy” gig (though certainly full of its share of challenges and frustrations) has turned out to be pretty sweet! AND as it turns out, I was not as completely unprepared as I thought. Thanks to my career as a music therapist. Developmental Milestones. You can be sure that since the moment Jaxon was born I have been observing his milestone’s like a hawk. Working with many children on the Autism spectrum, I KNOW to be vigilant about observing Jaxon’s eye contact, social interactions, language development, and motor skills. I feel like being a music therapist has given me the huge advantage of awareness. If something seems off, I am ready to call our doctor and early intervention specialists. I am aware of MANY resources available to him should we need them. Language Development. This is probably my favorite. I work on a lot of communication objectives in my work as a music therapist. Everything from choice making to labeling items to answering WH questions. I took sign language classes in college, and was able to use sign to communicate with Jaxon way before he could talk (who knew that would be so useful!). Now that he is jabbering about everything, I am able to help him develop his vocabulary everywhere we go. I can give responses in a way that helps him to learn new concepts. Behavior. Many of the classrooms that I serve have a behavior plan in place for each child. It is my responsibility to learn the techniques used in the classroom and apply them to music therapy sessions for consistency across environments. Since entering the “terrible twos” many of these techniques have come in super handy as a mommy. “First/Then” statements help encourage compliance. Simplified wording helps Jaxon understand exactly what is being asked. Knowing that if I place a demand, that I must follow through is a huge help. I frequently ignore undesired behaviors (within reason) and give lots of positive reinforcement! Does this make him a perfect toddler? Definitely not. We still have plenty of tantrums at our house. It just gives me a little more sanity to know that I am responding in an effective way. Overall, I owe much of my parenting philosophy to my work a music therapist. How about you? 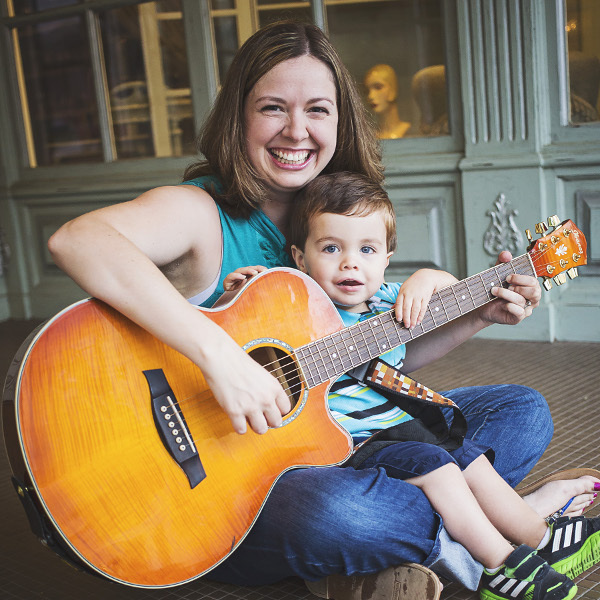 Has being a music therapist shaped your perspective as a mom? Or has being a mom changed your perspective and approach as a music therapist? Let us know in the comments! The following is a guest post by Jennifer Gossett, MT-BC, NICU MT. 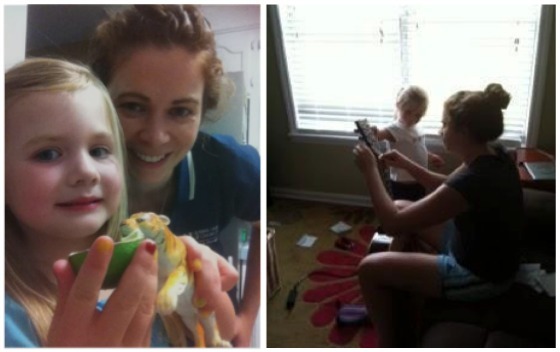 Jennifer is a Board-Certified Music Therapist based in Charleston, SC. She ventured into the field of music therapy after a 15-year career as a band director in public and private schools, and opened her private practice, Noteworthy Music Therapy, in 2012. Jennifer and her husband, Kevin, are parents of two sons, ages 12 and 10, each of whom has both special needs and special talents. 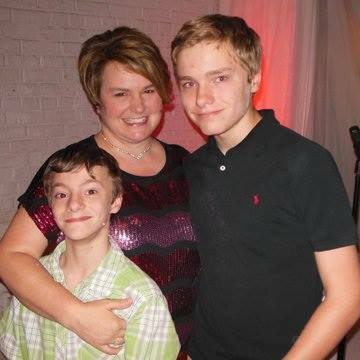 My sons were born in 2001 and 2004, and both were preemies. My youngest weighed 700 grams at birth, and the Beanie Baby that nurses placed in the isolette with him was as big as he was. Thankfully, our city has a Level 3 nursery for these tiny, fragile babies, so our boys had access to wonderful care and best technology available at the time. Between the two boys, we spent 18 weeks making daily visits to the NICU, rejoicing on the good days and crying on the bad ones, feeling helpless to do much of anything besides wait and pray. Blessedly, both boys survived their early starts, and for the most part they have thrived and blossomed. Today, they’re tweens who love music, video games, Pokemon and Legos. Like so many of these former preemies, they’ve had bumps in the road, developmentally speaking: one has a diagnosis on the mild end of the autism spectrum, and the other has the hyperactive/impulsive type of ADHD and a moderate hearing loss. So, we’ve spent many an hour visiting pediatric specialists, speech pathologists, occupational therapists, etc., and being immersed in the special needs world. Becoming a Mom changes any woman’s life, but I could never have guessed in 2001 how drastically my life would change in the years to come. I had been a music teacher before I was a parent; my training was in how to play the trumpet, how to conduct a concert band, how to assemble a bassoon or correctly grip a pair of drumsticks. I was NOT prepared to negotiate a world in which I would watch my child breathe on a ventilator, bring him home on oxygen, or advocate for his education year after year in IEP meetings. But as I grew and learned, I became drawn to the world of these special children and their families, and looked for a way in so that I could work with those children as I saw so many amazing professionals do for my own boys. It was then that I discovered my calling as a music therapist, and went back to college at the seasoned age of 38 to begin my new training. Fast forward to the Fall of 2013: I’ve completed the training, passed the board exam, and I’m a board-certified music therapist. I’m doing exactly what I set out to do—using music to connect with and enhance the quality of life of children with autism, Down Syndrome and other special needs. It was a dream come true, but something was missing. I felt that “pull” again, realizing there was something else I needed to pursue—an advanced, specialized training in music therapy practices for NICU babies. I headed to Florida, to the only site in the country that provides this level of training, for an intense few days of hands-on experience using MT strategies with these fragile infants. One other MT-BC was in the program with me, so we agreed to take turns holding the babies and going through the specific music therapy protocol. She took the first turn, which meant the next baby would be mine. He was very small, very squirmy, and very easily overstimulated. I held him as I’d been taught, began to hum…and realized tears were trickling down my cheeks. I was shocked, not realizing that the memories would come flooding back like that after nearly 10 years since I’d last entered a NICU. Call it PTSD, call it a trip down memory lane, call it what you will, but for me it was a powerful Mama Moment — realizing that my life-changing experiences as NICU Mom had now come full circle to my career in MT.